YJSG comes with few page class names applied to the html element. You can use those class names to style your page differently. bootstrapoff: depending on bootstrap version set in template manager, this class changes to, bootstrapoff, bootstrap2, bootstrap3. itemid: itemid class comes from your menu item id and is specific to each Joomla page. If you are on frontpage this class changes to homepage. com: this class is specific for each Joomla extension page. On this page it is com_content. view: this class is specific for each Joomla extension view page. On this page it is view-article. If your default text direction is RTL, body tag gets class name .yjsgrtl attached to it that will help you style your website based on text direction. <body id="stylefont" class="yjsgbody style_yjsg yjsgbr-chrome"> where .style_yjsg class name is specific for this template style. You can use this class to add specific styling to your elements. $yjsg_color->darker('percentage') = makes the color darker based on the link color. $yjsg_color->lighter('percentage') = makes the color lighter based on the link color. To make it easier for you we have already created $cc_css variable that you can use to define your multiple elements. As you can see we used default link color to style some of our elements. This can be further extended to use custom color for other elements based on link color. What file can I edit? Please do not edit or change template_custom_params.php file directly. This file is used for each template differently and it might be changed on template update. You can use yjsg_custom_params.php file instead. Just copy the variables or params from template_custom_params.php to yjsg_custom_params.php and extend them. If you were wondering where the $style_color variable comes from, this would be your selected stylesheet link color that you can find in template manager under the tab Style. After you have declared all elements that you would like to style based on link color you can change default color code for your stylesheet within your template manager and all elements defined within $cc_css variable will be changed and adapted based on this param. Increase your website ranking with custom rich snippets ( microdata ) options. These settings will generate structured microdata (schema.org) code snippets that will boost your search engines ranking. Article rich snippets can be activated in your article manager under the tab Yjsg Rich Snippets. This settings is disabled by default. Category rich snippets can be activated in Menu item manager under the tab Yjsg Category Rich Snippets. If set to yes, your category and its articles will get rich snippet type CreativeWork which is applicable to most generic kind of creative work, including books, movies, photographs etc. This settings is disabled by default. 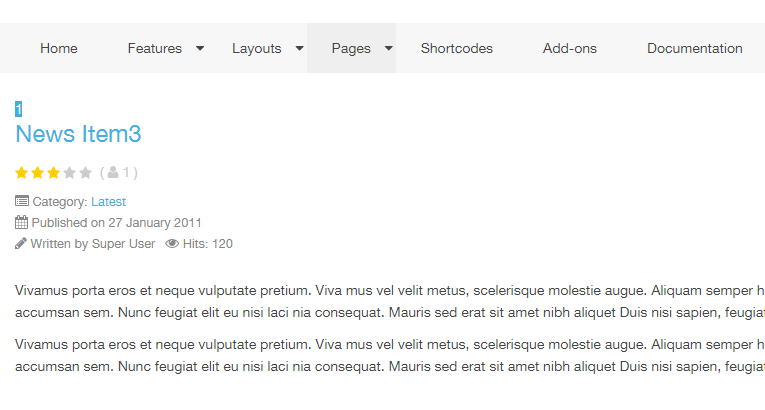 YJSG v2 is completely modular and gives you a chance to extend each part of it as well as Joomla article options. If you look in site_root/templates/eximium/custom/yjsgarticle/ folder you will find file name yjsg_article.xml. We have placed one custom parameter inside as an example. You can use this file to add any additional options that you might need for your articles. Please note that if you are using a template that was released prior to Yjsg v2, you would need to copy the file located in plugins/system/yjsg/legacy/html/com_content/article/ folder. Open the newly copied file and after the first php closing ?> add this snippet. Now go to your article view page and you will se the parameter output. 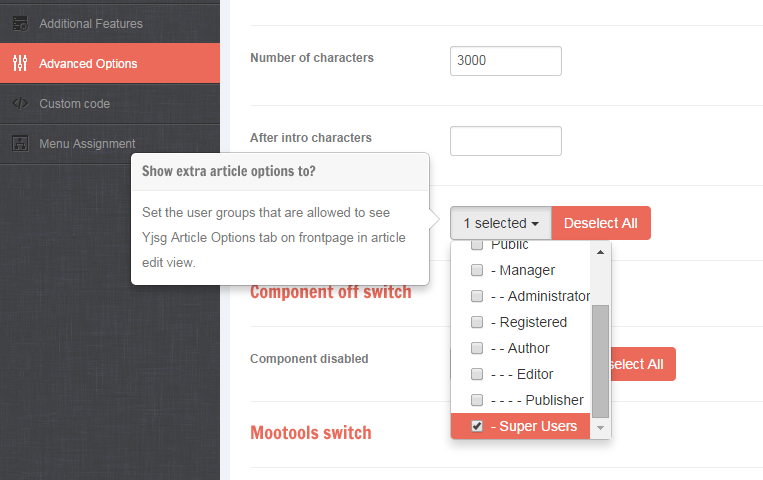 Yjsg Article Options tab is by default set to be visible only in administrator article manager. To see these optons tab in frontend please go to your template manager , tab Advanced options and set the parameter Show extra article options to? to desired user groups. YJSG v2 is completely modular and gives you a chance to extend each part of it as well as Joomla module options. If you look in site_root/templates/eximium/custom/yjsgmoduleoptions/ folder you will find file name yjsg_module_options.xml. We have placed additional module styles parameters in there as an example. You can use this file to add any additional options that you might need for your modules. The grids are setup so that by default if you have 1 module in the grid it will be as wide as the grid holder or if you have more modules in any given grid they will either get the assigned width value from template manager or they will split the holder width between themselves. In both cases you are not able to float them to a specific side without defining the floats and widths for them within css files. To make it easier for you we added Force float parameter in Yjsg Module Options tab that will let you force the module floats to specific side thus creating a gap between them or position them to the side you like. By selecting options Float left or Float right module will float to the defined side and it will also get assigned fixed width of the value you entered in Force float width parameter. YJSG comes with the option to place the top menu next to the logo faster and easier. Go to template manager tab Top Menu and set parameter Top menu location to In header an hit save. YJSG comes with YjsgBrowser class which is a lightweight PHP class for detecting mobile devices browser name or browser version. You can test it by adding following code block to yjsg_custom_params.php file. Every YJSG based template comes with custom.css. Custom.css is loaded as a very last file in header thus you have an option to override any CSS declaration from your template or extensions. We strongly encourage you to use this file to make any modification you might need. This way when there is a template update your overrides will still be in effect. Once you activate the custom.css in template manager, custom.css file will be placed in site_root/templates/yjsg_template_name/css folder. Please use custom.css file for all your CSS overrides or add-ons even responsive layouts. See example below for responsive layouts override. YJSG based templates come with yjsg_custom_params.php file which is a magic bullet for all developers. This file is located in site_root/templates/yjsg_template/custom/ folder and it "sees" all template parameters, functions and settings which gives you the power to override them. It is very easy to make your own conditions and have your template act on them. $midblock_off ------------------------------| <jdoc:include type="component"  /> and surrounding divs are disabled. check if grid is loaded with these variables. Default is false. $yjsg_grid_name - grid name as in yjsg1 | see complete list of grid names above. $add_width=true - will add class name yjsgsitew ( main site width class ) to the grid like: <div id="yjsg1" class="yjsg_grid yjsgsitew" />. $after - closing of what you started in $before IF you did not close it already or anything you want to add AFTER the grid. Since YJSG comes with support for Twitter Bootstrap which is based on LESS CSS , we included lessphp class by Gpeasy.com that compiles your LESS CSS files in to one CSS file. Here you can select which bootstrap version to use. You also turn Bootstrap off and use YJSG only which can tremendously speed up your website. Once you are done editing your website, set this ON so that all your CSS files get compressed into one stylesheet. If set to YES, this setting will compile and compress your generated CSS file and reduce the file size. This setting is mostly used by developers to see immediate changes to CSS/LESS files while editing. If this setting is set to YES recompile process will run in background via AJAX and it will not slow down first page load. Note that after any LESS/CSS file change you would need to wait few seconds and the script will do "hard refresh" so you can see the changes. If this setting is set to NO first page load will be slow until files are recompiled but you will see changes immediately.